This is a reimplementation of the main loop of pr2_ethercat without dependencies on PR2 software. It was mainly developed to be used by Shadow Robot Company. It may be useful to anyone people that has developed ROS software for their own robot and used etherCAT for communication. Most likely such software would be based on the software for Willow Garage's PR2. ros_ethercat reuses existing etherCAT drivers (eml package) and instantiates a ros_control controller manager. Part of the software in this repository comes from repositories pr2_mechanism, pr2_robot, pr2_ethercat_drivers. The parts specific to the pr2 robot only have been removed. Therefore, the same license (BSD) has been used. You can find the architecture diagram below for a closer look at how this works. In software with previous pr2 dependencies that is switched to this package, the following modifications are required. virtual void starting(const ros::Time& time),br. controller_manager and controller_interface should be used as dependencies in CMakeLists.txt and package.xml files instead of pr2_controller_manager and pr2_controller_interface respectively. calibrate.py file from pr2_bringup is now included in ros_ethercat_model package and renamed to just calibrate according to ROS convention. Launch files that execute calibrate.py should be modified to find it there. Transmissions are still defined in urdf in the pr2 style and inherit from ros_ethercat_model::Transmission. This class will initialize the actuators associated with this transmission. ros_ethercat accepts a new argument --period which is the period of main ethercat loop in msec. If not given the default value is 1ms. This is a reimplementation of the main loop of pr2_ethercat without dependencies on PR2 software. It was mainly developed to be used by Shadow Robot Company. It may be useful to anyone people that has developed ROS software for their own robot and used EtherCAT for communication to hardware. Most likely, such software would be based on the software for Willow Garage's PR2. 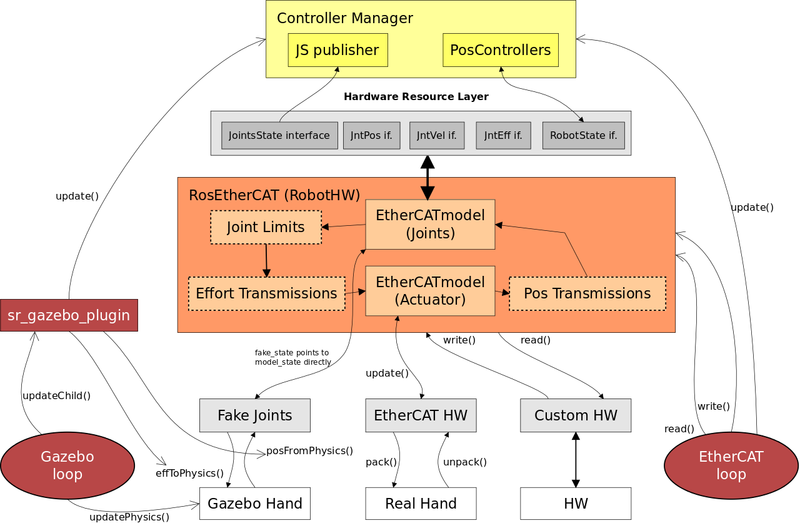 ros_ethercat reuses existing EtherCAT drivers (eml package) and instantiates a ros_control controller manager. Part of the software in this repository comes from repositories pr2_mechanism, pr2_robot, pr2_ethercat_drivers. Therefore, the same license (BSD) has been used. The following modifications are required in software with previous pr2 dependencies that is switched to this package. mechanism_statistics are now published by the ros_ethercat_model package. calibrate.py file from pr2_bringup is now included in ros_ethercat_model package. Launch files that execute calibrate.py should be modified to find it there. Transmissions are defined in urdf files and inherit from ros_ethercat_model::Transmission. This class will initialize the actuators associated with this transmission.